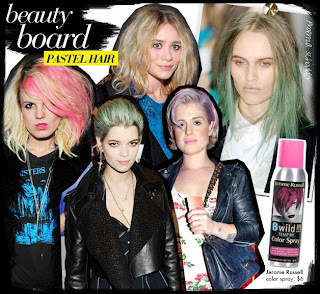 Anyway, I just wanted to point out one trend that I will NOT be partaking in...pastel hair! Pastel nails? yes. Pastel Lips? Yes. Pastel Hair? Hell to the No! Pastel nails and lips are gorgeous for the Spring trend! I disagree about pastel hair too! Also pastel eyeshadows would be great for Spring too! I'm glad that your feeling so much better and can't wait for more of your fashion posts as well as more makeup posts! Hope You get well soon! I recently discovered Your blog, and I'm happy that I have - very looking forward to new posts from You! Pastel hair seems like a big no, especially based on those photos. Although, in my head I can imagine some pastel hair colours looking nice, if done properly. But in these pictures, the hair looks all scrunchy and dry and uneven. Welcome back!! Pastel hair is certainly not something that I want! yak i agree, that hair is horrendous! Glad you're back and feeling better! I love it on people who can rock it lol ! I actually like the lilac hair on Kelly Osborne...I think it matches her personality...not many who are under 80 yrs old can pull it off--lol!